Matt Drummond's highly-anticipated family adventure "My Pet Dinosaur" premieres on DVD November 6 from Uncork'd Entertainment. The Dove-approved family film, described as a cross between E.T and Monster's Inc, features state-of-the-art visual effects, a heart-warming tale of friendship and the beautiful Australian countryside. After an experiment gone wrong, a young boy named Jake makes a new friend. When his new lovable pet begins growing larger and larger, it becomes hard for Jake to keep the mischievous creature a secret. While continuing to grow the animal starts some chaos around town causing the military start looking for their missing dinosaur. Now Jake and his friends must save their 'pet' in this heartwarming tale of friendship, mystery and adventure. 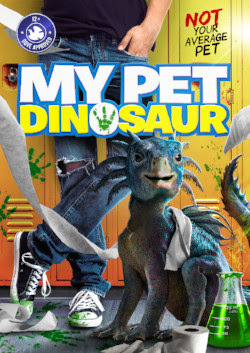 My Pet Dinosaur available on DVD November 6 (at Walmart).